We are excited to share that Nimble has been named CRM Market Leader and #1 in Customer Satisfaction for Winter 2016 by G2 Crowd. This caps off an amazing few years at Nimble where we have continued to grow as a market leader in CRM as the simply, smarter, social selling alternative to the legacy traditional CRM platforms. The Grid leverages customer satisfaction data reported by authenticated users along with vendor market presence determined from social and public data. Based on a combination of these scores, each software solution is categorized as Leader, High Performer, Contender, or Niche. Nimble shared market leadership with Salesforce and was ranked ahead of 34 other CRM relationship management providers in market leadership, customer satisfaction and value. Customer service was a key factor for CRM products selected as Market Leaders and Nimble was proud to be named #1 in both Customer Service and Value amongst all CRMs. Other key findings revealed that mobile and social features were important factors for customer CRM satisfaction both key areas of strength for Nimble. Social collaboration features and social network integration for all CRM Vendors were rated at an average of 70 percent, the lowest rated features across all product feature categories. Nimble’s Social Network integration rated 93%, the highest of all CRM’s. Nimble led the CRM category in the total # of reviews submitted by users, showing that we have a large sample size that love Nimble. Our ease of administration and quality of support ranked well above the average. Our “Quality of Support” rated 92% against Salesforce’s 78%. Our “Ease of Setup” rated 94% against Salesforce’s 77% rating. 92% of Nimble users would recommend us and 96% feel we are going in the right direction. These ratings show that if you are looking for a Simply Smarter Social Selling CRM that is ahead of the pack in features, ease of use, value and amazing support, Nimble will be an awesome choice for your business. These recent awards follow a series of accolades for Nimble, including: King of CRM by GetApp, the #1 CRM in Customer Satisfaction and CRM Market Leader by G2 Crowd. Nimble was also recognized previously as #1 Sales Intelligence in Customer Satisfaction and overall High Performer. 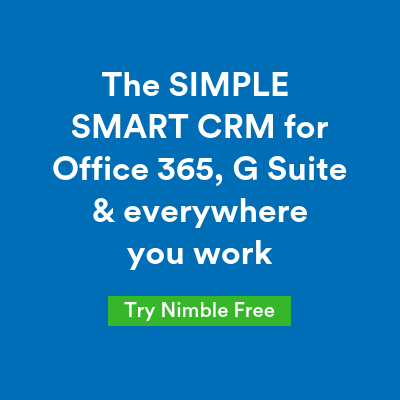 Nimble was named #1 CRM in numerous other reviews over the past six months including; #1 CRM for Small Business by Technology Advice, Highest Rated Software by Small, Mid-Size and Enterprise Business Users,Highest Rated CRM, Highest Rated Sales Intelligence, Best Software 2014 and Highest Rated Ease-of-Setup. Nimble was also recognized previously as #1 Sales Intelligence in Customer Satisfaction and overall High Performer. We would like to thank our 6,000+ global customers who leverage our simply smarter CRM to replace legacy customer relationship platforms that require too much work to install and maintain. These G2 Crowd ratings validate the power, simplicity, and value we provide for our happy customers and we plan to continue this trend into 2016 and beyond.